HomeFEATUREDr Drew presents monetary donation to CHS history club. Dr Drew presents monetary donation to CHS history club. 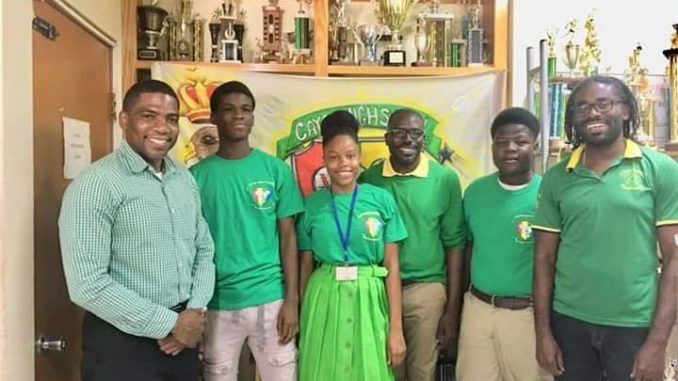 Basseterre, St Kitts, March 31, 2019 – Cuban-trained physician Dr Terrance Drew has made a monetary contribution to the Cayon High School History Club which is scheduled to visit the Republic of Cuba during the Easter Vacation. Dr Drew presented the monetary donation to the history club during the morning assembly. He used the opportunity not only to congratulate the staff and students for the contribution they continue to make in the education throughout St Kitts and Nevis, but also shared the experiences he had while studying in Cuba, the largest Caribbean nation. Dr Drew also pledged his fullest support to the school’s activities and encouraged the CHS Falcons the do their best during the just concluded TDC Interschool Championships. Mr. Vernon Wilkinson, history teacher who is expected to accompany the students to Cuba thanked Dr. Drew for his generosity. The CHS History Club is expected to join the Clarence Fitzroy Bryant College (CFBC) History Club on their 2019 educational history travel tour to Cuba during the Easter Vacation. Labour Party candidate expected to challenge PM Harris in the next general elections raises concern of nepotism.